JEREMY BERNSTEIN a professor emeritus at the Stevens Institute of Technology and a fromer staff writer for the New Yorker, He is a frequent contributor to the New York Reviiew of Books. He has held appointments at the Institute for Advanced Study, Brookhaven National Laboratory, CERN, Oxford, the University of Islamabad, and the Ecole Polytechnique. 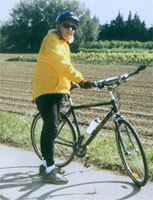 Dr. Berstein has written over 50 technical papers as well as numerous books on popular science and mountain travel. His latest book is Quantum Leaps.